Ronald Lanner, The Pinon Pine. I get out of the car and walk carefully toward her. Jan joins me. “Are you looking for pinon seeds?”, I ask. The woman stands up straight, looks at me and with a smile of shared knowledge, she says, “Yes.” She holds up a half filled Ziploc plastic sandwich bag filled with pinon. We come closer. “How do you know where the seeds are?” Jan asks. “It takes a while for your eyes to adjust. See, here is one.” Jan gets on her knees beside the woman and they quietly go about the search for pinon. Jan is getting pretty good at this, as she has a handful in fifteen minutes and gives the seeds to our new friend. I join the women are my knees. Searching for pinon was like looking for dark pearls among dense pine needles. Because we humans are forgetful of blessings, the Torah of God commands the Hebrew people to remember what happened in the Sinai wilderness by a commemorative meal called the Seder. This Passover Meal was to be celebrated every year to recall the story of the Passover of the angel of death over the Hebrew homes in Egypt and their liberation from slavery. The Haggadah is used today in Jewish homes as a ritual retelling of the sacred story. Most of the time, the Hebrew verbs are in past tense, remembering. At one point, the verbs becomes present tense, as those who participate today in the Passover Seder are transported in time and space to share in the exact event of the Exodus. 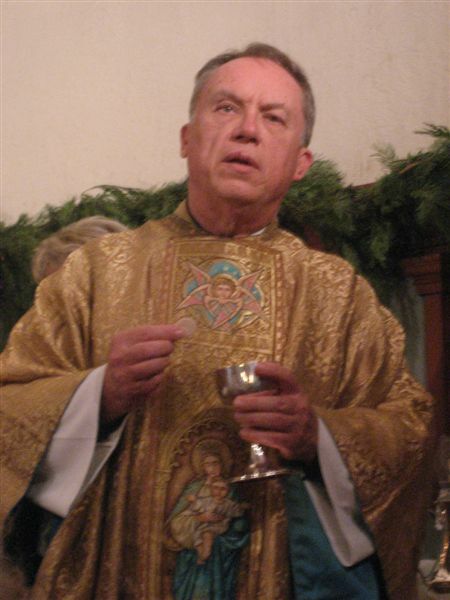 In the past, when I visited a parish, it was easy to evaluate how the priest celebrated the liturgy or compare the programs with what we had in Santa Ana. However, for a solid year, Janice, I, and Erik have been regular participants at St. Timothy’s. Because we are not Roman Catholics, I do not press the priest, who is a dear friend of mine, to give me communion. However, I have to share this with you. At the time of communion I am almost always overwhelmed with a powerful embrace of the Holy Spirit that squeezes me so tight I have to work really hard to hold back the tears of joy. This entry was posted in Blog and tagged desert spirituality, Eucharist, manna, Owens Valley, Paiute. Bookmark the permalink. Very nice, though if you’re going to publish this, I suggest an editing fix. As an alumni of Northern Arizona University, I have to tell you there is no “University of Northern Arizona.” NAU, not UNA. Not huge, but worth fixing on the next printing.